Computers and the Internet have turned our world around, making it so much easier to accomplish more things than ever before. One of the wonderful results of these changes is that we can now take an online home staging class in order to learn interior decorating and how to stage a house for resale. At Decorate-Redecorate, you have your choice of courses that range from the basics all the way up to advanced courses. In just seven short days or less, you can be on your way to becoming a home restager or interior decorator. You do not have to be a real estate agent and you do not have to have a four-year college degree to do something that can have such a positive affect on your future and your pocketbook. 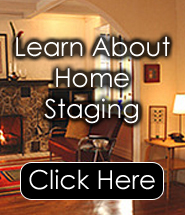 Never before has it been so easy to take an online home staging class. One of the reasons these courses take so little time to complete is because all of the fat has been trimmed out of them. What you receive are clear, concise courses that contain everything you need to learn in a nutshell. Yet, they are the most comprehensive courses you will ever find anywhere. There are other sites out there offering these types of courses, but you will not find any better training than you will receive here from Decorate-Redecorate. Learn from a teacher who has decades of experience in the decorating business. You can even take a course that will teach you a variety of skills at the same time. You can also get all of the tools of the business as well, everything from promotional postcards to slides to organizer totes, not to mention the top rated books that give you all of the tips you will need about color, moving furniture, furniture layouts, decorating software, and so much more. Make the move today towards a brighter future in interior decorating and preparing a residence for a sale. Enroll now in one of the many home staging classes offered and see what a difference it can make in your life. You will even learn about managing and marketing your new company, as well as ways to bring in more customers and how to expand your business. Visit www.decorate-redecorate.com to access all of these resources today. You will find all of the home staging classes you will ever need to get you started on your own career in interior decorating. Before you know it, you, too, can be pulling in profits in this fast-growing business. All Rights Reserved|By using this site, you agree to our Terms of Service.